Founded in 2011, grew out of a vision of collecting market data, popularity rankings on android apps, developers and history. We are the oldest service tracking Google Play history data. 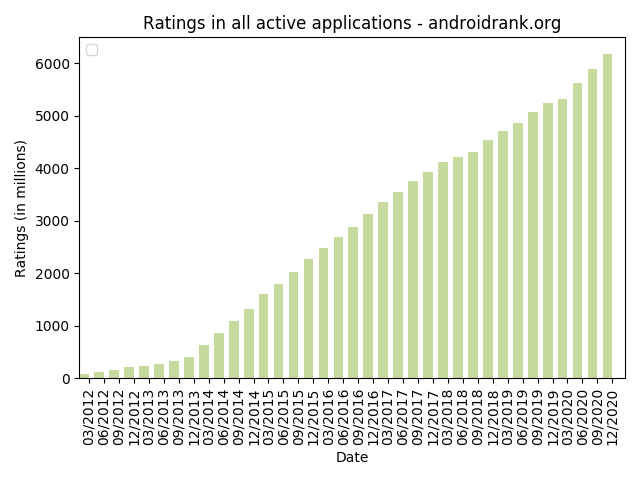 Androidrank provides statistics, android application rankings and app rank reviews based on public data of Google Play. We present custom android application statistics, developer profiles and android app comparison overview. Our web navigation and services are constantly improving. We also provide custom android market data exports. Currently we are indexing over 200.000 applications. androidrank.org is the oldest service providing open android market data for free, since 2011. Number of installs distribution. Includes 276045 apps achieved at least 10,000 installs. Application ratings count distribution. Includes 292596 apps achieved at least 100 ratings. Summary rating distribution for All applications. Includes ratings of 292596 apps achieved at least 100 ratings. Applications average rating distribution for All applications. Includes 292596 apps achieved at least 100 ratings. Interested in android market history and growth? 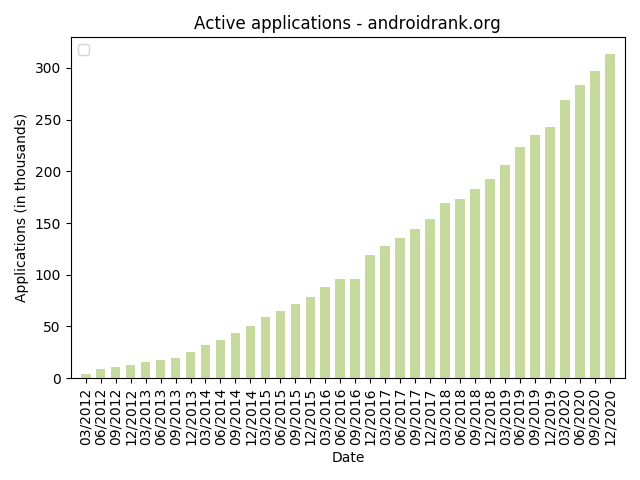 Following we provide a report on application data indexed by androidrank.org. This reveals the market growth and history in terms of application numbers, installs, downloads and application ratings. The report was provided on applications with at least 1.000 installs. We work on a further data analysis and custom reports. Android market growth in number of installs. 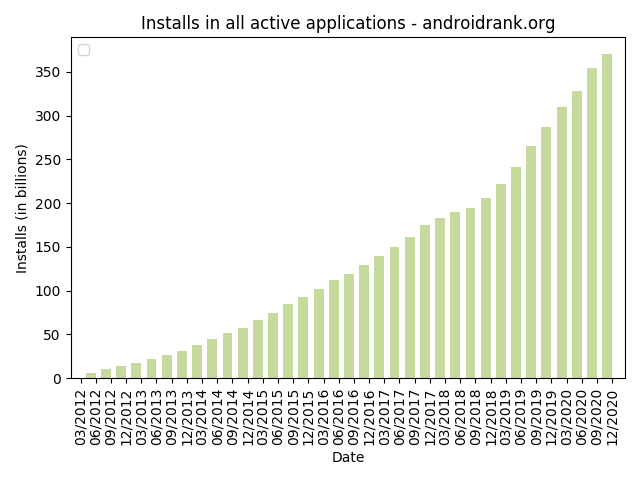 The following chart displays time report on the total number of application installs. Android market growth in number of ratings. The chart displays the total number of ratings for all active applications. Android market growth in number of applications. The following chart displays the number of active application over time. List of android apps with most installs. Below is the list of apps which achieved 500 million installs on Google Play. Androidrank is a free service that lets anyone to see historical data of android market. Q: Where do the data come from? The data displayed on androidrank.org portal come from data displayed on web of Google Play (formerly Anroid Market). Q: How to get an app indexed on Androidrank? Currently, we do not provide a way to add apps manually. The app is indexed as soon as it pass basic criteria of our process, which is to have at least 100 ratings on Google Play.